Fighting corruption and improving governance are undeniably key factors for achieving and sustaining development, globally as well as nationally. Until now, however, corruption and governance often have not been fully integrated into development agendas and efforts, most notably global commitments like the Millennium Development Goals, which were agreed in 2000 and are to be achieved by 2015. Yet all this may be about to change. We need a transparency revolution, so citizens can see exactly where and how taxes, aid and revenues from extractive industries are spent. The panel’s report places governance and peace among the five “transformative” factors affecting development beyond 2015. As the report states “Good governance and the fight against corruption are universal issues” (pg. 50). It also recommends a stand-alone goal to “ensure good governance and effective institutions”, including a target to reduce bribery and corruption among public officials. Building on these goals, the report also touts the call for a “transparency and data revolution” to make sure the public knows what governments are doing – and not delivering on. The report is just a first step – it is a long, two-year road ahead that we are about to go down. The next stop is the Open Working Group on Sustainable Development Goals which is a country-led process made up of UN member states who are tasked to put together a list of goals which likely will be the template for the new global commitments that go before countries to debate. 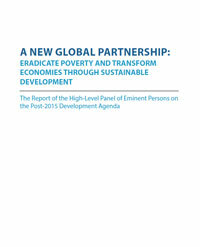 While the report is one of numerous consultative initiatives to draw up a new set of development goals by 2015, it has the tremendous potential to serve as a game changer for development. It has set the mark for a governance goal. Putting governance so high on the agenda shows how much the development debate has radically – and positively – shifted since 2000. Most importantly, the inclusion of the governance and peace goals in the panel’s report speaks to what people are demanding of their governments and the institutions that are supposed to be at their service. Transparency International chapters around the world have worked to strengthen this link – whether by getting local officials to deliver on public services through public pledges or empowering communities to demand better schools, clinics and water delivery. What these chapters and communities understand is that governance and anti-corruption serve as forces behind eliminating poverty. Both are preconditions for sustainable and equitable development. “An honest and responsive government” was among the top three priorities for people surveyed in recent global poll of more than 600,000 men and women from around the globe. Conducted by the United Nations to get feedback on development priorities, the poll put governance at number three after good education and better healthcare. Countries will ultimately decide if the governance goal and corruption target stay. But with the expert recommendations out there, let’s hope transparency wins the day and makes it an impossible political fight for countries to take such promises back. Organised by our chapter in Rwanda, actors drawn from the community explain that people have legal rights to free public services. Informed citizens are empowered to say ‘no’ to bribes that school masters may try to charge for free schooling or that doctors may try to exert for care that should be free.